Salsa, Hummus, and Dip, Oh My! One of the simplest, and most awesome-est things to make in a food processor are salsas and other such dips. So far I have used this magic machine to make your typical tomato based salsa (with varying degrees of spice due to the plethora of peppers offered at my local Whole Foods grocery store/martini bar/entertainment center), pineapple salsa, strawberry avocado salsa, peach salsa, traditional hummus, edamame hummus, and a list of dips too long to even recount. The beauty of the FP is that you can head down to the farmers market, Whole Foods, or whatever your local grocery chain may be, see what is fresh, throw it in there, and wha-bam! Next thing you know you have a party pleasing, seasonal dip. OR if you want to be even more creative you can incorporate your salsa or dip in a dish such as this. When you are talking dips or dip- like substances, the sky is the limit with your trusty FP. Word to the wise #1: The pulse button is your friend. For all you FP virgins out there, you can either turn the machine on and let it run or used the pulse button. When making chunky dips or sauces, chopping, slicing, etc. do NOT just turn it on and let it run because instead of pineapple salsa you will end up with pineapple dust. Butters (and I don’t mean this or that). Another special talent of the FP that especially rocked my world was that it can make you your own homemade peanut butter. That’s right folks, just throw in the peanuts and run it until you get a butter-like substance. I’m looking forward to taking this to a whole new level by making other nut butters. Check out this article for some amazing ideas about cooking with nut butters, which, as it turns out is not only really super exciting but also healthy. Who would have thunk it? Oh, and don’t stop your adventures in buttering with nuts. I topped a nice cut of tuna steak with this rich basil butter and it took one of my favorite easy weekday meals to a new high. Ok now let’s get serious. Dip-phish. Butter-phish-posh. You can make a mean soup or hearty sauce on this little rascal. A few weeks ago I was given the opportunity to do just that when I was invited to a True Blood premiere party and asked to bring a dish. I decided to make a version of a meatball which I have heard called a Viking Meatball (in honor of my favorite vampire and Viking pictured here for your viewing pleasure). And then I kicked it up about a thousand notches when I turned the meatballs into sliders, a perfect party finger food, by…. wait for it…. using my FP to make homemade rolls. WHAT WHAT! Well it doesn’t cook the stuff but it makes bread, roll, or even pizza dough making a ridiculously manageable activity. Forget trying to perfect your kneading techniques and throw away that rolling pin- if you have a FP, just throw on the dough blade, and you are all set. 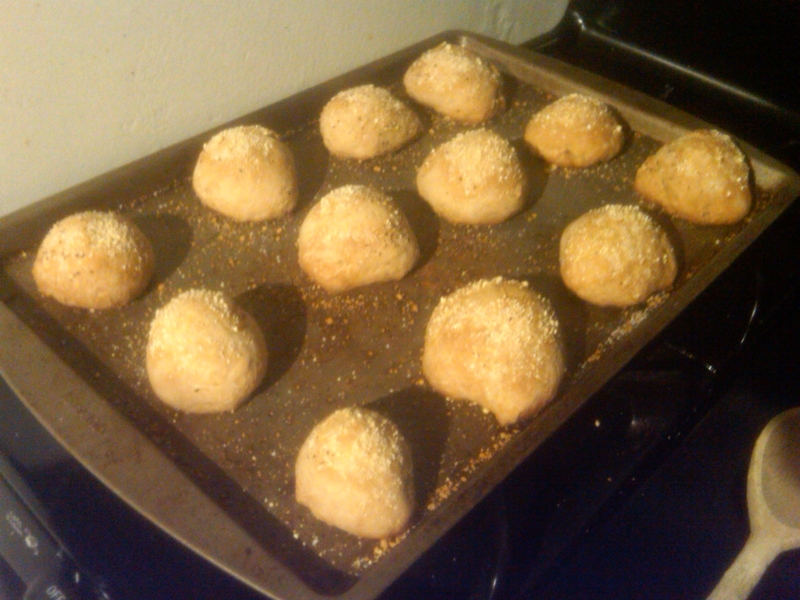 I have made wheat bread dough, biscuit dough, pizza dough, and of course these lovely roasted garlic buns. Word to the wise #2: When I process the dough in my FP, it tends to jump around the counter a lot, so I keep a close eye on it. At first I was worried that this wasn’t a good thing and that the FP was about to explode but since nothing has gone wrong so far I will just assume this is my FP’s way of telling me how excited it is about the bread-making too. Mix the first 6 ingredients together with 6 tablespoons of cheese and form the mixture into 18 balls. Over a medium-high stove heat the vegetable oil and brown the meatballs, working in batches. Move meatballs to a side plate and pour off any remaining oil and dripping. Heat olive oil in pan. Add onion, garlic, basil and fennel seeds and brown (about 5 minutes) then add tomatoes, bring to boil, reduce heat to low, cover and let simmer for about 30 minutes. Transfer sauce to FP and puree until smooth (Tip: leave the stopper out of the top of the FP to let steam escape but cover with a towel when you process unless you want a lovely red hue added to your kitchen décor). Return sauce to pan and add meatballs, cover and simmer for about 30 more minutes. Before you begin the dough-making roast the garlic in the oven for about 45 minutes at 300 degrees (I poured a little olive oil on mine and wrapped it in aluminum foil before putting it in the oven). When it comes out you can squeeze the roasted garlic cloves out and chop them up. Combine the water, molasses, yeast and olive oil in your FP with the dough blade in place. Run until combined. I used a little trick and added the olive oil in a slow pour to the mix as it was processing. Add the flour, salt, and chopped garlic and run until the dough is in one single mass and the FP cleans the side of the bowl. Run an extra 45 seconds to knead the dough (this replaces the manual kneading). The dough should be sticky but manageable (for me this took two tries, the first batch came out runny and gooey so I tried again and added a touch more flour and it came out much better). Place in a mixing bowl brushed with olive oil, cover and store in a warm area until it rises to double its size (for me this took about an hour). Portion to dough into 18 dough balls on a baking sheet and allow to rise again for 20-30 minutes. Sprinkle the rest of the grated cheese on top along with a pinch of salt and pepper and bake for 20 minutes at 400 degrees. I need to get one of these if I’m going to get serious about Indian food.